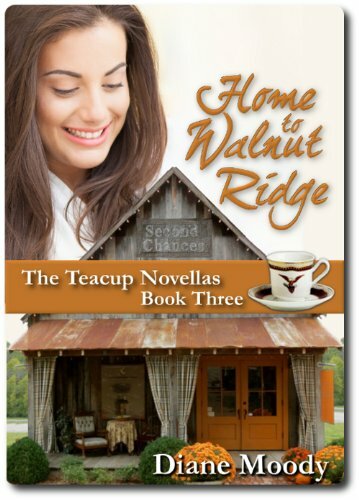 Home to Walnut Ridge – The Teacup Novellas Book ThreeIt seems everyone needs a second chance. Tracey Collins just left Washington D.C. after her dream job became a personal nightmare. Back home in Jacobs Mill, Tennessee, she quickly realizes she’s not the only one needing a fresh start. Her sister Alex is in the midst of a career change, finding new inspiration restoring furniture. Their father, a former pastor who’s had his own share of disillusionment, now mentors a strange bunch of misfit bikers who do odd jobs around town as ministry. Among them, an intriguing former attorney named Noah, still running from a painful past, catches Tracey’s eye. Secrets are uncovered and hearts are restored in Jacobs Mill as they all work together to renovate an old smokehouse into a new shop called Second Chances.